I'm surprised (and impressed) that 33 of you have given spontaneous fermentation a shot! The technique is currently only used commercially by the last few Lambic brewers in Belgium and a handful of American bug nerds (the likes of Russian River, Jolly Pumpkin, and Allagash). The general concept is that the boiled wort is exposed to the air, allowing whatever bacteria and wild yeast are present to colonize the beer and ferment it. The results can be mixed, so most breweries that employ spontaneous fermentation rely on blending for consistency and quality. 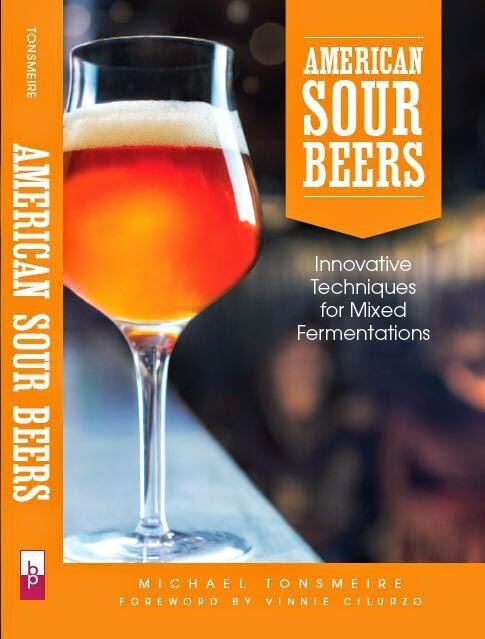 Despite my love of brewing sour beers so far I've only used microbes obtained from yeast labs and bottle dregs. Introducing added risk by trusting wild yeast for a beer that needs a year or more of age is a bit off-putting for me. That said, I'm considering giving it a shot later this year once cool weather returns (from what I understand the bacteria floating around during hot/damp weather often leads to off flavors). The closest I've gotten was using a sourdough starter to ferment part of my second batch of Kvass, which is kinda-sorta like a bit like spontaneous fermentation. Speaking of which I was just up in Pittsburgh two weeks ago assisting at East End Brewing on their annual batch of Kvass (more details to come). I'm also in the process of brewing my first batch soured with microbes harvested from the malt. It isn't exactly a sour mash, but it is in the same direction (souring the wort pre-boil with a starter grown from 1/2 cup of crushed Marris Otter) with a pure strain ale yeast added post-boil to complete the rest of the fermentation. If you've given ambient/spontaneous fermentation a try please post a comment (or shoot me an email) with your technique and what your result were. I'd also be interested where you left the wort for exposure (orchards/vineyards seems to be a popular choice). As a side note I just noticed Freshops is selling 3 year old Willamette "Lambic" hops. The Lambic summit inspired me to give a spontaneous fermentation a try as well. I've decided that I will build a small 10-15 gallon coolship out of stainless steel and use that as the basis of my experiments. I would love to have a collaborator if you want to help me experiment. At the least we should do a comparison of the and spontaneous beers that are produced. I guess it depends on how loose your definition of "spontaneous" is or is not. I have made Cysers, that were not inoculated with any commercial yeasts, just the yeasts and bacterias present in the cider. I guess that doesn't count technically as "spontaneous", but it's pretty damned close. Either way, those brews made with only the wild bugs came out great. Very, very, very similar to lambic I would say. I did a sour mash using whatever was on a handful of malt, but that's a more established technique. I sour mashed 20% of the grain for 3 days. I was terrified of opening it, but it smelled clean and bready / yeasty. It went into my first try at a Berliner Weisse (using your grain bill) because I don't want to ferment with lacto and have to get another set of bottling equipment. The wort did not taste noticeably sour, I may add straight lactic acid at bottling. A few years back I left a hydrometer sample out overnight and it spontaneously fermented into something smelling like dog farts and garbage. This showed that my old apartment wasn't the best place to try this, but I'd be willing to give it a shot somewhere out in the country. I have spontaneously fermented the second runnings of a dark mild. I didn't drink it because it smelled like rubbing alcohol and rotten beans. Innoculation with some malt + dried fruits. It is spontaneous in the sense that no "culture" yeast was added, but only the critter living on the malt/fruit. It turned out a good "witbier" but without lambic (brett) smell. I think the notion of "spontaneous= from open air", is a bit exaggerated, since it seems that the stuff innoculating Lambic is mostly stuff from the brewery anyway (dust, especially malt-dust from the mill, circulating in the brewery, and most of the yeast is living in the wood of the barrels already). I wish I had seen the poll when it was still going so I could add my yes vote. Last February I did something of a hybrid turbid mash and left the wort outside overnight (in Georgia) with only a cheesecloth to protect it from large stuff and insects. It has been fermenting now for 4 months and smells pretty awful. I won't give up on it for at least another year, though. I used some Willamette hops that I kept in a paper bag in my attic over last summer. I may not ever do this again (even with a positive outcome) but I HAD to try it once. The kvass should be fermented out pretty quick, going to the brewery would be your best shot, but I'm not sure on the release specifics. I believe most Lambics actually start fermenting before they get to the barrels (in the "horny" tank), but you are right that bugs from previous batches do get in on the action once it reaches the barrel (bu those bugs in turn came from the air previously). The barrels are cleaned so it isn't like they are pitching directly onto a slurry from a previous batch. Regarding aged hops, also check out the 7 Bridges close out section. Interesting hops, like 2% AA Belgian Saaz. I used those in a lambic I brewed in November. What prevents Clostridium from growing in a spontaneous fermentation? They smell pretty awful. Is it the hops? Tom, I'm not sure on Clostridium. It may be that it grows in the first day or two and then dies when the alcohol rises and the pH drops (as Wild Brews indicates for E. coli). I have done the "leave it on the porch covered with cheesecloth" trick. I suppose I sort of cheated since I used about 1.5 quarts to collect the yeast/etc and stepped it up a few times before making beer out of it. I also needed to add commercial yeast after about two months since it stuck at 55% attenuation and 4% abv (commercial yeast dried it out nicely). Before I added the commercial yeast I racked it and put another beer on the lees (this one also needed commercial yeast help eventually). I enjoyed the results, the beer was quite cidery at first but has developed some interesting smoky notes over time. I only left the wort outside for 8 hours overnight. Two other attempts at collection (afternoon exposure and inoculation with backyard strawberries) produced yeast and mold, not so good. I've also done both sour mashes and inoculation with a handful of grain. Results vary but I haven't had one come out unpleasant yet. Oh, regarding the botulism, I would guess that the spores can't survive once the pH drops. You can eat the spores and not get sick because of the low pH in your stomach. Beer won't get quite that low, but I believe it's still low enough. Back in april I did one down here in Kemah, Texas with a gallon of saison. I placed the wort in a one gallon bucket with cheese cloth over the top, secured with a rubber band. I placed the bucket in between my azaleas and rose bushes and let it sit outside for 18 hours. I then transferred to a gallon jug and placed an airlock on it. Coincidentally, the dewberries growing in the woods behind the house really starting ripening at the same time so I went ahead and dropped quite a few in. After the dewberries settled I got a pretty impressive pelicle. I still have the batch in the gallon jug. My plan is to brew another 5 gallons of saison and then dump the gallon jug in to inoculate the wort. I was really surprised how easy it is. I haven't done one yet, but like you I was planning to try, this upcoming winter. My plan was to brew up a 5 gal batch and divide into 1 gal experiments. I'll take each gallon to a different location around San Diego (vineyards, orchards) and put it out overnight in baking dish with a cheesecloth cover. Then taste them in 6 months and see what I got. From what I read it is more likely you get wild sacc., lacto and other molds/bacteria but brett and pedio are usually in the wood. So I might need to add these at the 6 month point. I have never fully spontaneously fermented a beer, but i do have a "house" yeast strain i use quite often. i caught it in my backyard using a cheese cloth covered coke can full of wort. it's an interesting strain, and i'm still experimenting with it a lot, but it really isn't sour at all, more fruity, and "belgian" tasting. It tends to favor beers lighter and color, and makes wonderful ginger beer. I intended on brewing a lager clone but my disorganization left me with 8 gallons of finished wort and no yeast properly started to pitch into it. Then I screwed up the starter and it wasn't till a week and two days later that I had enough yeast to pitch. I opened up the chest freezer that had been holding the wort at 55 degrees for about 4 days (was at 34 the remainder of the time), and I see a healthy looking foam on the top. There is no crausen, indicating to me this is a bottom fermenting strain, plus at low temps like 55 the wild strain must be akin to a lager strain. I'm excited to see what happens. Maybe it's not going to be a lambic but the results should still be interesting. Certainly sounds like you might get something interesting. The cold temperature reduces the chance that the lactic acid bacteria will do much, although you may need to let it warm up if it is going to spend weeks/months in the fermenter before bottling. 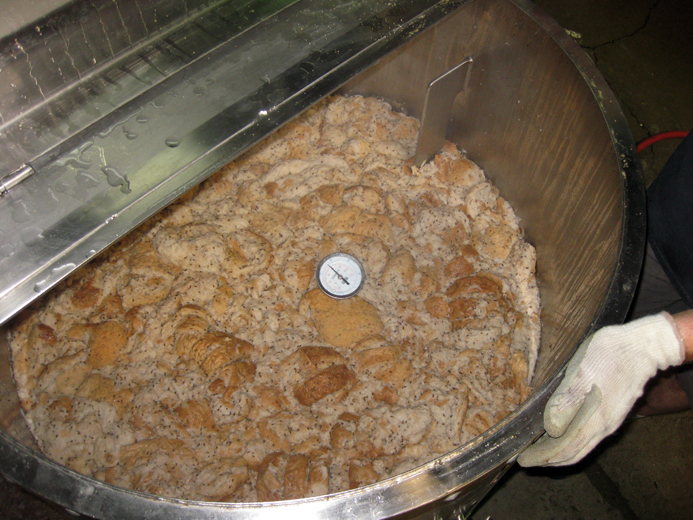 The amount of krausen is related to how flocculant a yeast strain is (that is even assuming it is yeast). Most wild yeast have poor flocculation (it is a character brewer’s selected for), so a light/airy foam on top isn't surprising. I believe lager yeast was actually a hybridization that didn't exist in the wild (there are some interesting studies of its genome). Let me know how it turns out. My batch is progressing nicely, its lost the big tropical fruit character it had when it was young and now has a good earth funk and the first signs of acidity. This is also a good reason to always keep some dried yeast in the fridge for an emergency like this (saved me a couple times). I brewed a hopped mead and added about 200 grams of Juniper berries into the secondary. The berries had loads of the whitish haze of wild yeast; about a week after adding the berries ethyl acetate showed up to the party MASSIVELY. It was text book ethyl acetate nail polish remover flavors in pretty high concentration. Ethyl Acetate's boiling point is a bit below ethanol's so I held half of the batch just above Ethyl Acetate's boiling point to get it down to drinkable levels but I still dumped half of the batch. Recently I had a pleasant wild yeast infection take over from some yeast I repitched. It generated the nice banana and clove phenols of a Bavarian hefeweizen strain (I hadn't brewed with a wheat strain in over 2 years) but it produced another flavor chemical that half of my friends can taste but I can't taste whatever it is and their flavor vocabulary didn't help me to identify what the off-flavor was. I brewed a mead using the yeast present in the honey and ended up with loads of off flavors, too. So far I haven't had much luck with wild yeasts. I made my first all grain mash brew the other day with a friend's equipment. I'm pretty sure everything was clean and carboys sanitized. I left the finished wort out with a loose lid on outside for about an hour two at the max. I added raw unfiltered local Tupelo honey before the hop boil. My Started had failed and I didn't have any yeast. The brew store was closed for the next two days. (poor planing on my part but I do what I can when I can) Three days in and my brew is active now, light non dense big bubble flocculation. Not what I ment to do. I'm totally WTF. After reading this and a couple of other threads there is no way I'm waiting a year on the off chance I got some good bugs doing good work. Of which I have no idea of what's going on or anything about it. So I'm gooing to pitch the weissbier yeast I should have and see what happens. I'll let yall know. Pitching yeast will certainly speed things up, but with a variety of wild yeast and bacteria in there I would be reluctant to bottle it anytime soon. Those wild microbes will continue to consume chains of sugar too long for the ale yeast, and could lead to explosive carbonation in bottles over the long term. If you can keg, or bottle in plastic that would be much safer. I made an attempt recently. But did a saison ferment first, then added Brett brux. After some 3 months i added gooseberries. Then waited 3 more. A peculiar fungi like layer formed on top of the berries not being submerged. It tasted nice when extracting a sample from the tap in the bottom. I bottled when it hit 1005. I am slightly worried about the fungi, could it be an infection and even dangerous to consume?